I’m continuing on my journey to write about all the Field Notes Colors editions that have been released so far and are in my possession. After my post on Arts & Sciences last time, I’m choosing something more positive and up-beat: Grass Stain Green. Grass Stain Green is the summer edition of Field Notes COLORS from way back in 2009. I wish I had known about Grass Stain Green (or Field Notes) for that matter, when it was released because it is an absolutely stunning edition. It’s very summery with a medium-green color that resembles grass, and a wonderful texture from letterpressed type on the matte cover. As you can see, I only have a single copy of it that I managed to acquire years after its release. And I don’t think I’ll be able to use it any time soon, as I highly doubt I’ll find more of it at a reasonable price anymore. It is a very old edition after all (3rd in the series), and it’ll only get more valuable as time goes on. But boy, am I glad to experience at least one. It’s one of my top favorite Field Notes ever (see my FN ranking here; I'm not alone either). It is one of the more straight-forward editions but it has just enough rich details – the letterpress “blind hit” on colorful, thick French Paper, green graph grid inside – that make it a truly special edition. A simple combination that works great for the original format, just the way I like my Field Notes. As I mentioned earlier, Grass Stain Green (GSG) is a very early edition, 3rd only after Butcher Orange and Butcher Blue. And I would like to think GSG is when Field Notes realized their subscription idea was seriously becoming a thing. For one thing, the Butcher editions were so successful that Field Notes more than tripled the edition size, from 500 packs to 1,650 packs with GSG. Interestingly, its back cover says 5,000. I assume they mean 5,000 books. Doesn’t matter, it still sold out right away. They kept some of the same features from the first two editions: the generic white belly band with black text, the item number “FN-01”, the same original “Practical Applications”, silver staples, and a graph grid on Boise Paper innards. 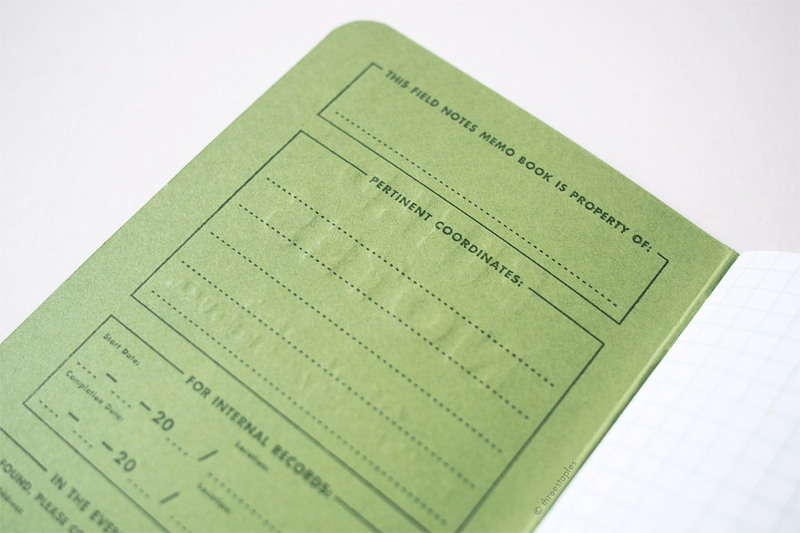 But Field Notes started having a little more fun and introduced a few major “firsts” in Grass Stain Green. 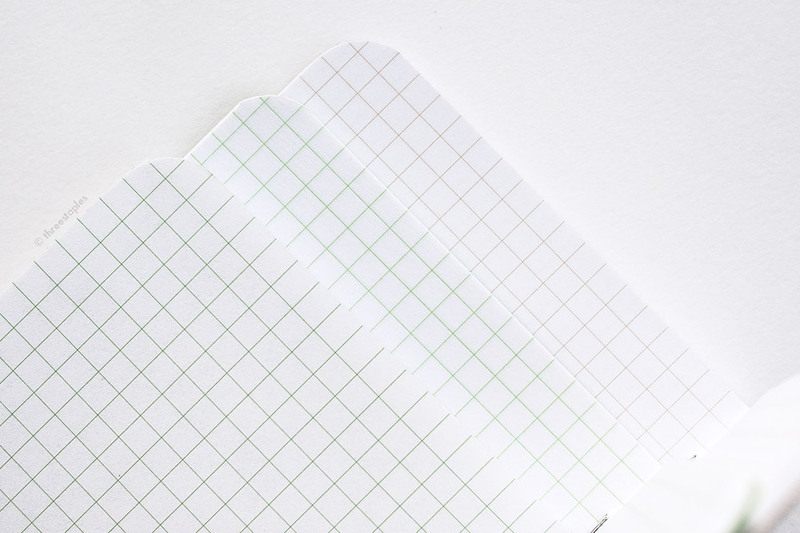 Silver staples + green graph grid. The major “first” is that the cover in GSG is letterpress-printed, whereas the Butcher editions are offset-printed. It was printed by hand at Flywheel Letterpress, and the resulting heavy impression gives the cover a nice debossed look that you can feel with your fingertips. I absolutely love it. And it’s printed with tinted varnish, giving the text a slightly glossy variation. Maybe I’m reading too much into it but it truly reminds me of fresh grass blades in the sun. And if you ask me, the grass theme seems very appropriate for Field Notes (for summer no less). Very American. The great expanse of green yards was one of the first things that left me a deep impression when I came to America. And squirrels. But I digress. There are other Colors editions that follow GSG’s footsteps, like Raven’s Wing (Fall 2010) and Fire Spotter (Fall 2011), both hand-printed by Flywheel. But what really sets GSG apart in my opinion, in addition to it being the first letterpress edition, is that it looks like it’s letterpressed on the inside cover, too. You can actually see and feel the text printed on the inside covers showing through the paper on the outside (see the ruler showing through in the picture above). I think no Colors edition has had letterpressed text on the inside since GSG. It’s probably too expensive and time-consuming to do that these days with the bigger edition sizes, if we learned anything from Two Rivers (Spring 2015). Anyway, this letterpress goodness in GSG makes it a highly desirable and unique edition in my book, and the fact that the text inside is printed with “Green Mind” green ink for that tone-on-tone effect is just awesome icing on the cake. Quick grid comparison (from left): Green grid in Capsule AW14, slightly lighter green grid in GSG, Original light brown grid. The other “first” worth noting is that the graph grid on its body paper is “colored.” It’s printed in a light green color called “Photosynthesizing Chlorophyll” instead of the “Double Knee Duck Canvas” light brown from the first two editions (and from the regular kraft FNs). The next Colors edition to deviate from the norm is Just Below Zero (Winter 2009) with a blue-grey grid. Obviously, I haven’t used GSG to be 100% sure, but the green grid doesn’t look too dark or distracting for writing. Another interesting “first” in GSG: the naming of the edition. It’s something I might have missed, had I not watched FN’s Recap Video #1. The first two limited editions were named after the name of the paper color, i.e. the cover in Butcher Orange is made with French Paper Dur-O-Tone in “Butcher Orange” and Butcher Blue with “Butcher Extra Blue” from the same line of paper. The cover in Grass Stain Green is also made with French Paper, Pop-Tone in “Gumdrop Green” to be more specific, but Field Notes gave it an original name, that evokes a color you see on a “white t-shirt after rolling around in the grass” according to Jim Coudal in the aforementioned video. A sure sign the Field Notes Colors series was starting to take shape. Lastly, and this might sound trivial but it’s not to me: GSG is the first summer edition! There have been many summers since, and other summer editions like County Fair (2010) and Day Game (2012) are quite summer-y as well. But in my eyes, nothing says “summer” like Grass Stain Green does. Field Notes really started with a bang, and I’ll probably forever compare all future summer editions to Grass Stain Green. Quick color comparison (from left): DDC “Sorta Jade”, Starbucks Coffee Origins “Asia/Pacific”, Summer Camp, Neon Ice Pop, Unexposed, Our503.com, National Crop “Soybeans”, Shenandoah “Sweet Birch”, Grass Stain Green, Shenandoah “Chestnut Oak”, Day Game “Outfield Green”, Balsam Fir, Ambition, Shenandoah “Red Maple”, and Original Kraft. Grass Stain Green is the 3rd quarterly limited edition of Field Notes, released in Summer 2009. Edition size: 1,650 packs according to the official website, 5,000 printed on the back cover. “Practical Applications” are the same as the ones found in the regular kraft books. Are you one of the lucky people who got Grass Stain Green when it was first released? If so, would you want to see it reprinted? I would, for sure. But I’m not sure how likely an all hand-printed edition will be from now on, with edition sizes getting bigger and bigger. One can hope!